Polymers are the most important ingredient in rubber compounds and are composed of two or more monomers. ERIKS has a fully equipped laboratory for polymer testing methods. We ensure we only have the best chemists and engineers with extensive academic and practical know-how in the rubber industry. What does polymer testing methods include? ERIKS has decades of experience with rubber compounds. 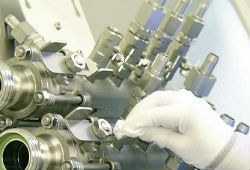 We are capable of designing, developing and testing rubber parts and compounds. We offer fast delivery, competitive prices and excellent support. ERIKS’ current product range includes sealing technology, flow technology, industrial plastics, power transmission and tool & maintenance products. Technical and logistical services are part of it. Our customers are from the whole rubber chain, from suppliers to recycling companies and everything in between. For more information about ERIKS and our polymer testing methods, contact your nearest ERIKS location. Or fill out the ‘Ask ERIKS’ form on the right.